Paul French Video Celebrating 25+ Years! Paul French Video is a family business based in Herefordshire, UK since 1990. 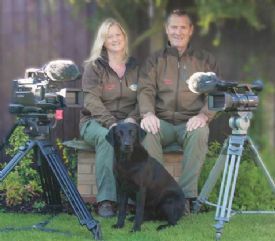 Since then Paul and Jeannine have built a reputation for filming, the production of interesting and informative gundog films. We take pride in the production of professional gundog training films with top gundog handlers, who are known for their achievements in the Field. Paul has grown up with dogs, he ran Spaniels and Retrievers in Field Trials in the early 70’s. Paul’s parents, Roly and June French, both A-Panel Retriever judges. Paul began filming Field Trials when his father Roly French, qualified for the Retriever Championship for the fourth time in 1990. Recorded History in the making. We film the IGL Retriever, English Springer Spaniel, Cocker Spaniel, Irish AV Spaniel, Pointers & Setters Championships annually, increasing our extensive library of recorded history, supporting and promoting the working dog s port.